Belgium's official Twitter account made a hilarious gaffe after they confused Japan's World Cup star Shinji Kagawa with certain WWE superstar from the same country. Roberto Martínez's men go into Monday's World Cup last 16 match full of confidence after winning all three of their group stage matches against England, Tunisia, and Panama. While the team is doing fantastically well on the pitch, their social media team made an embarrassing blunder on the eve of their knockout clash against Japan. The blunder happened in a tweet when Belgium's Adnan Januzaj was talking up his former Manchester United teammate Kagawa as their main danger man. 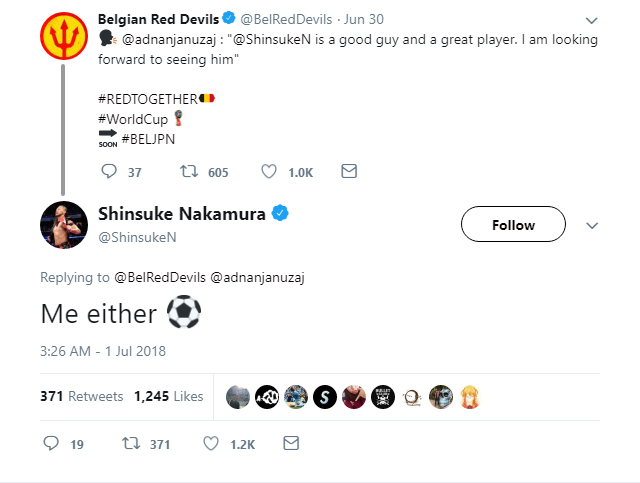 Instead of addressing and tweeting to Kagawa's Twitter handle, the Belgium Twitter account tagged WWE star Shinsuke Nakamura, who even jokingly replied.